Tenby Bed and Breakfasts. Compare latest rates and Live availability for all your favourite places and places you have always wanted to go using our new My Shortlist feature. Click + to add to your Shortlist. Bed and Breakfasts in Tenby, Pembrokeshire for 1 night from Sat Apr 20, 2019 to Sun Apr 21, 2019 within 10 miles, in an Average Nightly price range of £1 to £200. Behind the Old Town Wall, this hotel is located in Tenby, overlooking Tenby Harbour and Carmarthen Bay. It is a 5-minute walk away from Tenby Rail Station. Each room at the Royal Lion Hotel has its own bathroom with toiletries and a hairdryer. Other facilities include a TV and facilities for making tea and coffee, and most rooms have views of the sea. Guests can have a drink at the bar and a full English breakfast is served every morning. With views of Caldey Island, Clarence House Hotel is just 200 metres from Tenby's beaches. The lively town centre is just a 5-minute walk away. Guests can enjoy a drink from The Seagull Bar in the beautiful rose garden, or play pool or darts in the games room. With views of the coast, the seafront dining room provides light lunches and breakfast options. Each room has a TV, with many featuring a flat-screen TV. Also provided in all rooms are free tea and coffee and a private bathroom with a hairdryer. Tenby Rail Station is less than a 10-minute walk from Clarence House. Boats to Caldey Island can be reached in 10 minutes on foot. There is a lift to all floors and a disabled entrance to the side of the building. The dining room, bar, reception area and lift are all level on the ground floor. Situated in Pembrokeshire Coast National Park, The Giltar Hotel offers beautiful sea views, modern rooms with en suite facilities, and an enviable location overlooking South Beach. Free Wi-Fi is available throughout. The classic Victorian building features stylish rooms with tea and coffee-making facilities, a digital TV and hairdryer. Many rooms have coastal views, and some feature a luxury bathroom with a roll-top bath and bay windows. The on-site restaurant serves locally sourced Pembrokeshire produce, and is open daily for lunch and dinner. There is a spacious guest lounge overlooking the sea, where Wi-Fi is available for a small charge. Limited free private parking is also available. The Giltar Hotel is situated on the Esplanade in Tenby, overlooking the monastic Island of Caldey. Tenby town centre is a short walk away, and Tenby Rail Station is just 10 minutes' walk. Pembroke town and dock can be reached in 20 minutes. 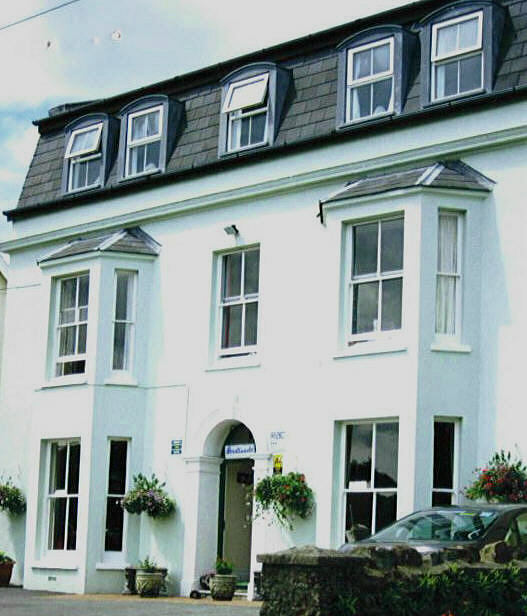 Boasting a shared lounge and bar, as well as a restaurant, Cliffe Norton is set in Tenby. This property is located a short distance from attractions such as Tenby Castle. Free WiFi is available. All guest rooms in the hotel are fitted with a kettle. Every room is fitted with a private bathroom with free toiletries and a hair dryer. At Cliffe Norton all rooms come with a wardrobe and a flat-screen TV. A Full English/Irish breakfast is available each morning at the property. Tenby Castle is 4.3 km from the accommodation, while Carew Castle is 7 km from the property. Situated in a quiet residential area of Tenby, the family-run Weybourne Guest House offers free Wi-Fi access in public areas. This typical Victorian townhouse retains some original features. The rooms include a TV and tea and coffee making facilities. Each room benefits from an en-suite shower room with a hairdryer and complimentary toiletries. In the mornings, Weybourne Guest House serves full English breakfast. The dining room has a large collection of old pictures and prints of Tenby. Early breakfasts are available with prior arrangement. A room service menu is also available. Ideal for walking and cycling activities, the Weybourne has a selection of maps and guide books. The guest house is only a 5 minutes' walk from Tenby Harbour, the beach, and the town centre. Tenby Castle is a 10-minute walk away. With wonderful views across Tenby Bay, The Park Hotel offers beautiful cliff top terraces and gardens, an outdoor swimming pool, free Wi-Fi and free private parking. The hotel is peacefully located above Tenby's Blue Flag North Beach, with the Pembrokeshire coastal path running adjacent to the grounds. The lively town centre is just 10 minutes' walk away. Classically decorated, the rooms at the Park Hotel each have a private bathroom, flat-screen TV and tea/coffee facilities. Many rooms also have panoramic coastal or countryside views. Guests can enjoy candlelit dining and hearty breakfasts in the hotel restaurant, where the traditional home-made food is served. Freshly brewed coffee can be provided in the relaxing hotel lounge. Featuring free WiFi throughout the property, The Broadmead Boutique B&B offers accommodation in Tenby. Guests can enjoy the on-site bar. Free private parking is available on site. The rooms all feature free WiFi, a flat-screen TV and a private bathroom fitted with a power shower. Guests can relax in the south-facing garden or in 3 lounges. Tenby Castle is 1.4 km from The Broadmead Boutique B&B, while Tenby Castle is 2.6 km from the property. The nearest airport is Swansea Airport, 45 km from The Broadmead Boutique B&B. This charming 3-star hotel offers bright, spacious, airy en suite accommodation in the heart of the quiet little village of Saundersfoot, just a short walk from the harbour and beaches. The hotel boasts 20 charming and well-appointed en suite rooms, a lift to all floors and secure off-street parking available for guests' use, free of charge. The stylish conservatory restaurant uses the finest local produce to create delicious, home-cooked fresh food. The Gower Hotel is a friendly, family-run establishment that offers personal service and a genuinely warm welcome. In a beautiful, tranquil location, nestled amongst acres of lawns and fields, this charming 4-star country house B&B has been run by the Rees family for 50 years. This elegant Georgian house has an idyllic setting in its own delightful grounds in the picturesque village of St. Florence, 3 miles from Tenby. During your stay, you can explore the interesting village inns, historic Flemish chimneys and enjoy the peaceful setting of this colourful, fragrant village, which has blossomed into one of the foremost floral villages in Britain. The historic building boasts plenty of period charm and beautiful original features, including marble fireplaces, panelled doorways and large picture windows. All of the attractive, individually decorated rooms are en suite and include bathrobes among all other excellent modern facilities. Elm Grove Country House is a Gold Award winner for Best Serviced Accommodation & Finest Pembrokeshire Breakfast at the Pembrokeshire Tourism Awards. They have also been awarded the Pembrokeshire Produce Mark. It has been rated as 4-star Guest Accommodation by Visit Wales. From Easter guests will also be able to pre-book in-room spa treatments. There is a self-catering cottage available for weekly rental in the summer, from Saturday to Saturday only. It may be available for shorter rentals outside this time. Set in the charming village of St Florence, the Parsonage Farm Inn offers bed and breakfast accommodation, good food, open log fires and real ales. Parking and Wi-Fi are free. The Parsonage Farm is a 5-minute drive to Tenby centre and a 15-minute drive from the coast. A full English breakfast is served in the morning. At lunch and in the evening, guests can enjoy freshly prepared dishes made with locally sourced produce. The bedrooms are unique and all have their own bathroom with a hairdryer. Other facilities include electric kettles and TVs. Set in the charming village of St Florence the Parsonage Farm Inn offers bed and breakfast accommodation good food open log fires and real ales. Parking and Wi-Fi are free. The Parsonage Farm is a 5-minute drive to Tenby centre and a 15-minute drive from the coast. A full English breakfast is served in the morning. At lunch and in the evening guests can enjoy freshly prepared dishes made with locally sourced produce. The bedrooms are unique and all have their own bathroom with a hairdryer. Other facilities include electric kettles and TVs.